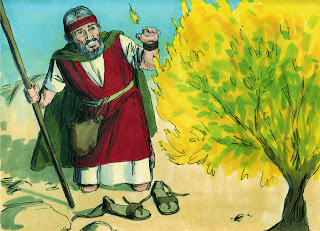 Today's lesson is Moses and the Burning Bush. You can see a more condensed version here. 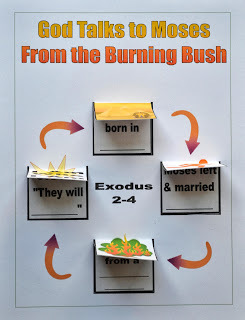 The above link also has the directions for the burning bush visual you see in the next 2 photos. 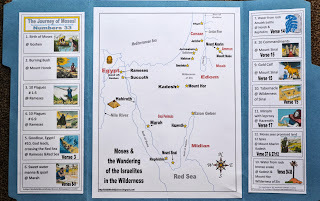 I have tables set up and I am adding a visual for Moses each week. 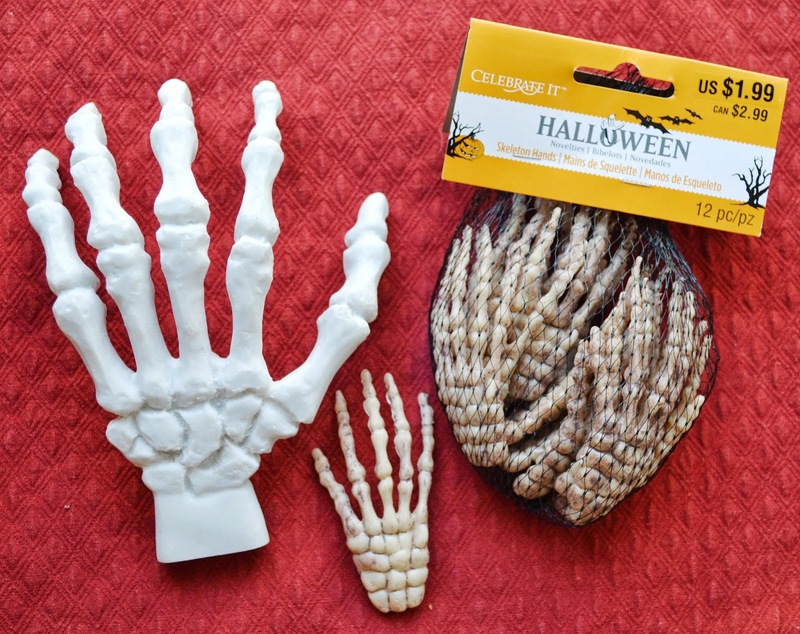 And, if you can find my leprosy visual and take home at Michaels, the kids LOVED it! Review: Last week we started our Bible study on Moses. 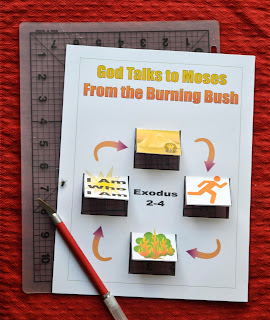 Moses wrote the first 5 books of the Bible and we find our lessons in the book of Exodus. 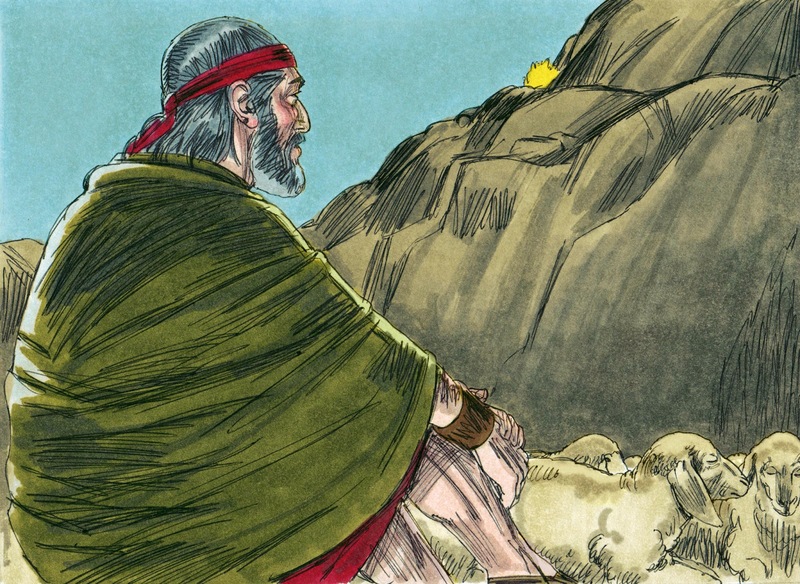 Moses’ father was Amram and his mother was Jochebed. Moses had a sister Miriam and an older brother named Aaron. 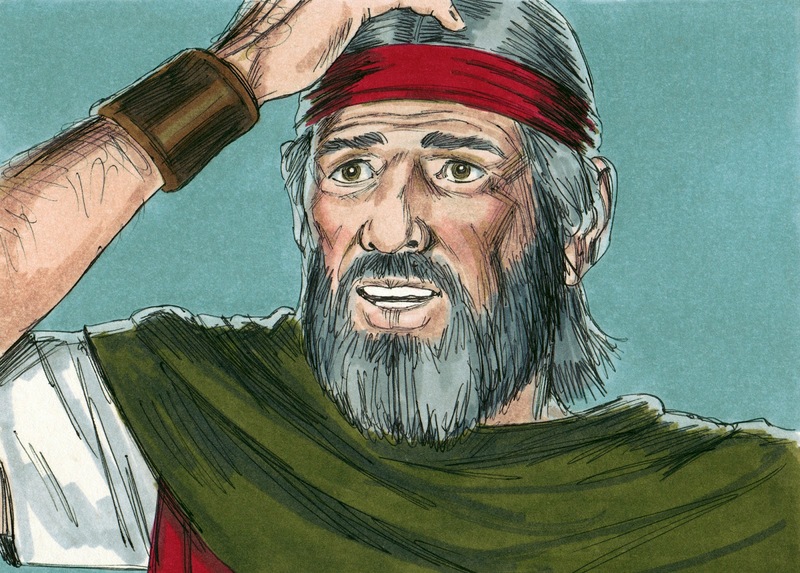 Pharaoh (king) of Egypt was worried because there were so many Hebrews! They were very strong! Pharaoh made them slaves building things for him and Pharaoh wanted the new baby boys to be killed. 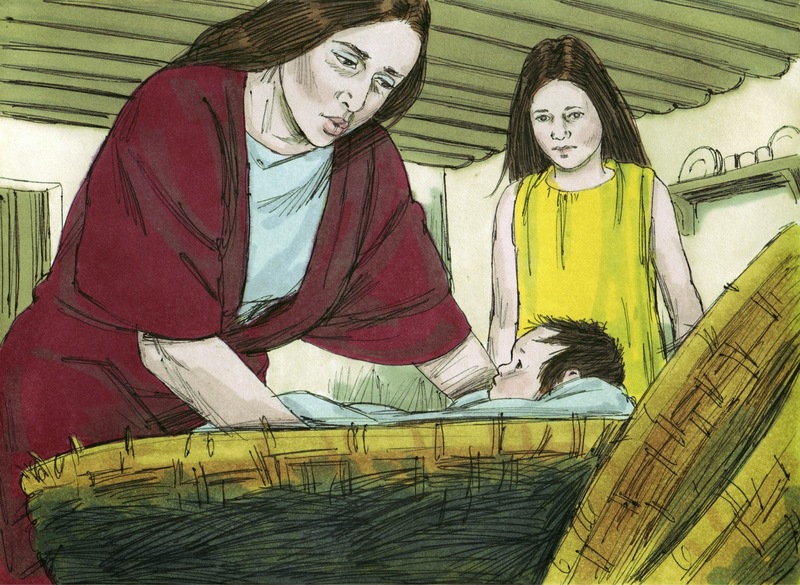 When Moses was 3 months old, his mother, Jochebed, made a basket from bulrushes, and put Moses in the basket. 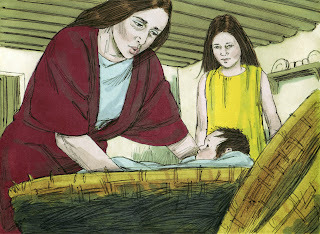 She put the basket in the river and the Pharaoh's daughter found it. 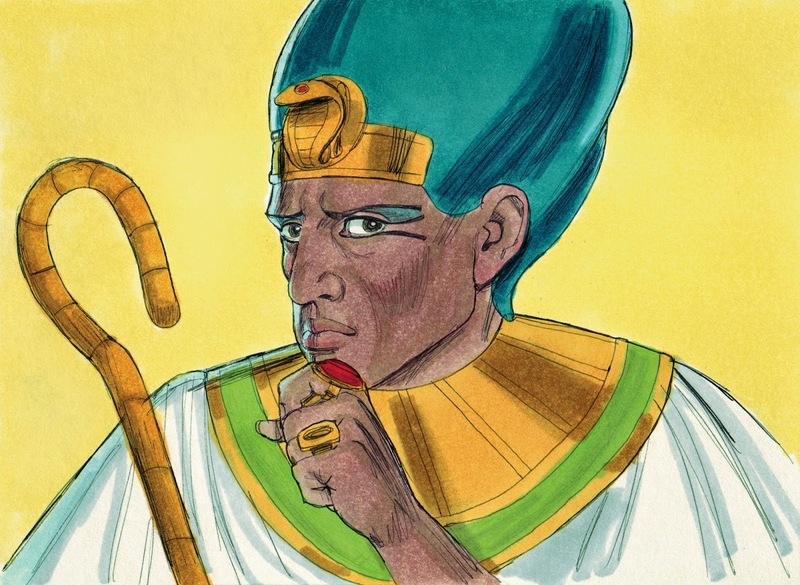 Pharaoh's daughter named the baby Moses because "I drew him out of the water". 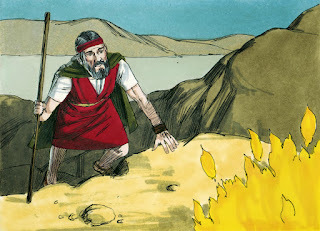 When Moses was older, he saw an Egyptian beating a Hebrew man, and when no one was looking, Moses killed the Egyptian and buried him in the sand. The next day, Moses realized that others knew what he had done and Moses ran from Egypt. Lesson found in Exodus 2:15-4: Moses stopped by a well in Midian. 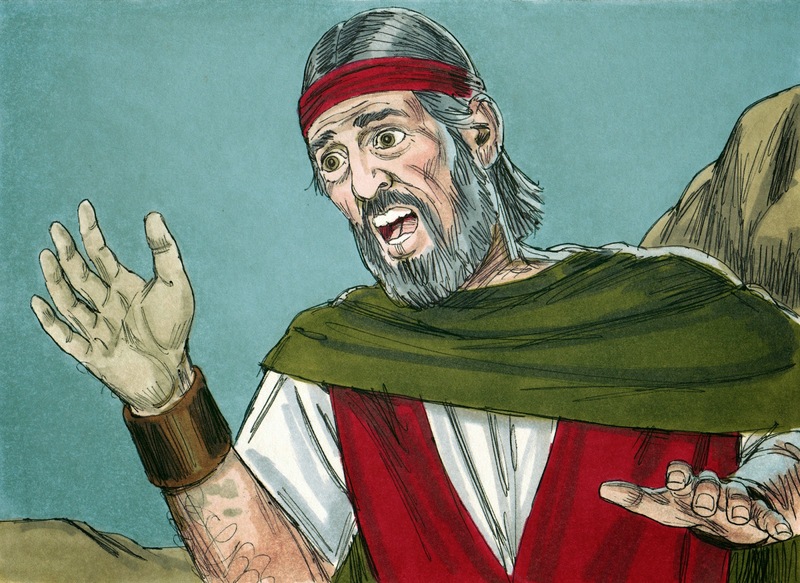 The priest of Midian was Reuel, AKA Jethro and he had 7 daughters. They came to the well to water their sheep. When they had the water drawn, some shepherds came and drove them away, but Moses helped the daughters take care of their sheep. When Jethro asked why they had returned home so quickly, Zipporah said that an Egyptian helped water the sheep. 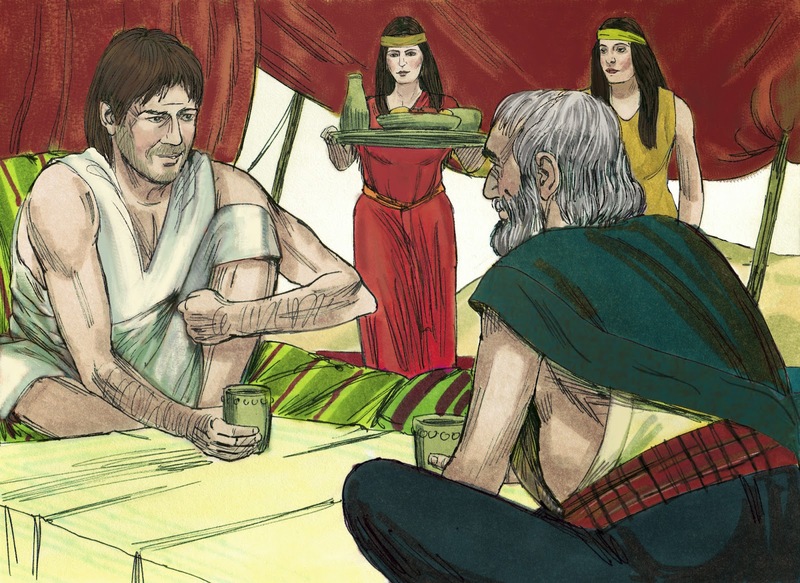 Moses was asked to eat with them, and he was satisfied to stay in Midian. Now, the people were crying to God to save them from being slaves. God heard their cries. (chap. 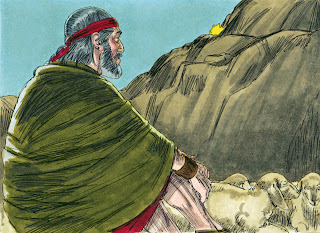 3) One day, when Moses was moving the sheep, he came to Horeb, which was the mountain of God. 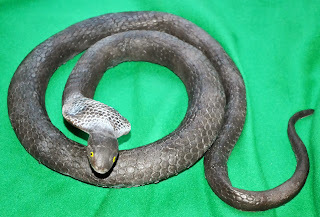 I use this snake and a really nice tree limb for Moses' rod. 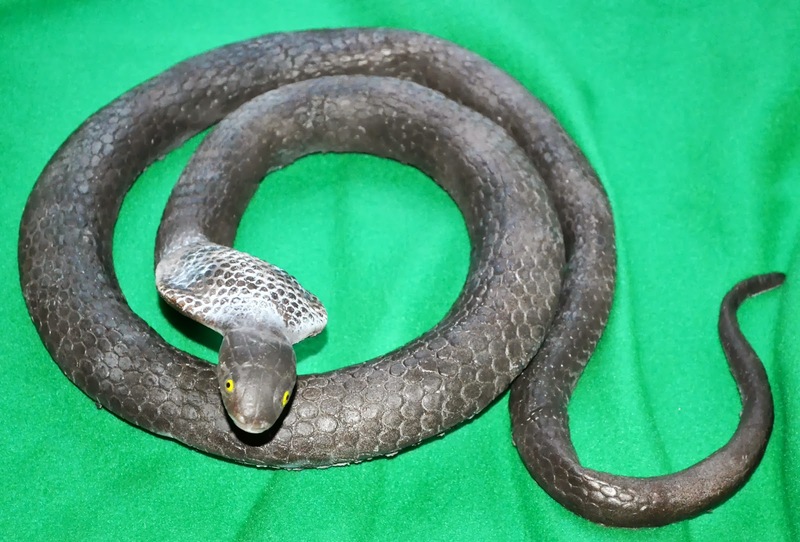 I toss the rod down, and pick up this snake! The kids just love it! I let one of the boys pick it up by the tail and made his day! 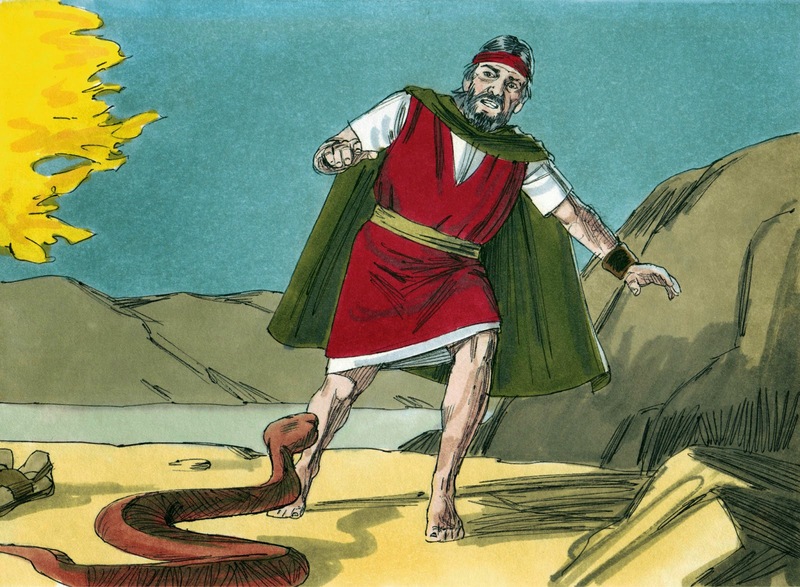 So, Moses asked “What if they don’t believe me or they won’t listen to me?” God told Moses to throw down his rod and it turned into a snake… Moses ran from it! When Moses picked it up by the tail, it returned to his rod. 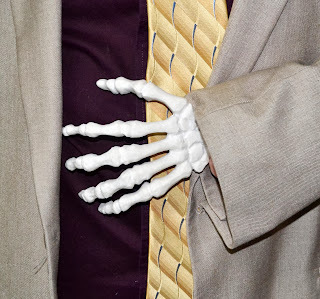 This is my husband for the picture, but I had this hand tucked under my armpit and when I put my hand inside my sweater, I brought this out! Oh, they loved it! The kids didn't see me hide it under my sweater, and their eyes just popped! 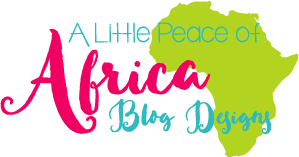 It was so much fun, I showed my preschool grandkids and they loved it too! I put it back in, and left it under my armpit again! I have to say that when I did this again the next week for review, and they saw the hand under my arm, they loved it just as much! I purchased these at Michaels in the Halloween dept. I gave the kids one of the small ones to take home! Again, they loved these! Moses still isn't convinced, so God tells him to "Put your hand in your bosom." Moses does, and when he pulls out his hand it is leprous! 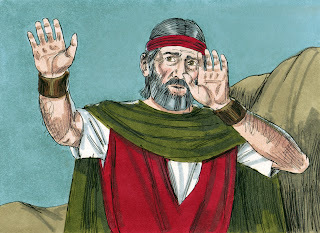 When Moses repeats it, his hand is normal. God tells Moses that He can do anything! God told Moses that if Pharaoh didn't believe the first 2 signs, then Moses was to pour water from the river onto the dry ground and it would turn into blood. God told Moses to go to Aaron, his brother, and Aaron will do the talking and you will show the proof of Me.” Moses took his family and returned to Egypt. We will begin 3 lessons on the 10 plagues next week! This is the burning bush visual I made for this lesson. I used orange Halloween lights with the flicker. Looks a lot better in person! I made these Lift-the-Flap question and answer projects for today's lesson. I printed the top page on cardstock, and the bottom page on regular paper. I used a craft knife (as seen above) to cut the flaps, leaving the top attached. I glued the two sheets together, careful not to get glue on the flaps. This is what the finished paper looks like. You can print it in color or black & white. Today's Bible verse for students (6 per sheet). Teacher's visual (1 per sheet). You can find more on Moses & the Burning Bush here. 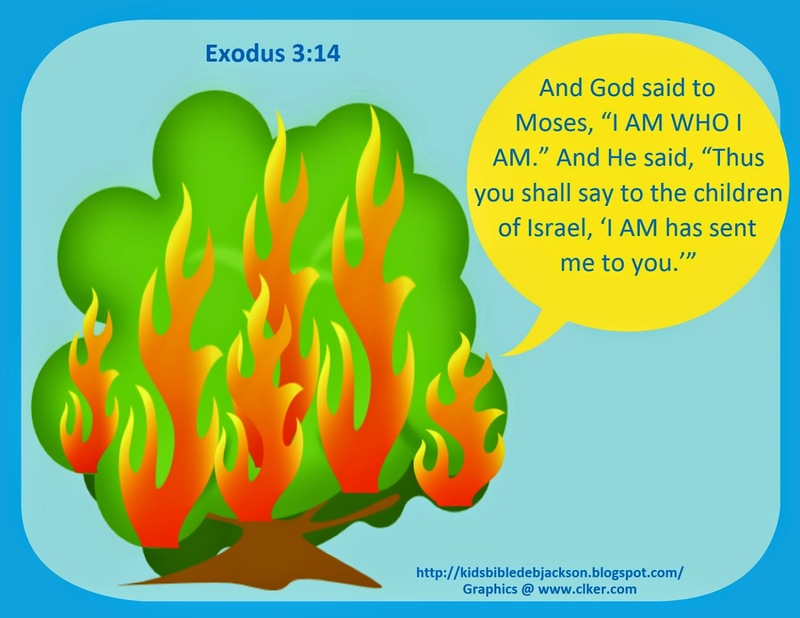 Your burning bush visual is so cool!! Thanks for sharing. This is great! It's so complete. Thank you. This is a wonderful post. 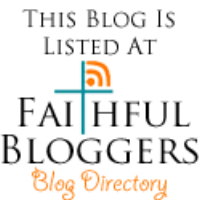 Thanks for sharing it at our Thursday Favorite Things Blog Hop. So glad I found you through the 123homeschool TGIF linkup! 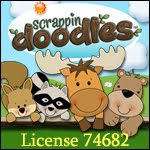 Always happy to find fun ideas to help my little one learn and remember scripture stories! Thank you! Wow! What a fabulous lesson! Thank you so much for sharing it! Thanks so much for the nice comment! Glad you stopped by! Thanks so much for having the link up parties! I appreciate it! Thank you for the lesson and activities! I was stumped about how to present this lesson and you have provided some great ideas and take home activities. Thank you! Thanks so much for the nice comment! I appreciate it and thanks for stooping by! Thanks for stopping by and leaving the nice comment! I appreciate it! These are really wonderful ideas. Thank you so much for all your time and effort. I volunteer to teach our four 3-year olds and sometimes a 1 year old as well. These ideas are so creative and interesting for them. I love how interesting you make the lessons. Thanks, again, for sharing your ideas!